In this 2010 file photo, al-Shabaab fighters display weapons as they conduct military exercises in northern Mogadishu, Somalia. A Maryland man arrested on charges he fought on behalf of an al-Qaida-affiliated terror group in Somalia pleaded not guilty Wednesday and his lawyer said he will fight the charges. A soft-spoken Maalik Alim Jones, 31, entered the plea in Manhattan federal court to five terror-related charges, including that he trained with and supported al-Shabaab, an ultra-conservative Islamic militant group seeking to run Somalia under a strict interpretation of Shariah law. The plea to charges that could carry a potential life prison sentence came a month after Jones was turned over to U.S. authorities by Somalia authorities who arrested him Dec. 7 as he allegedly tried to get a boat to travel to Yemen. According to court documents, Jones, a U.S. citizen born in Maryland, confessed to FBI agents that he fought Kenyan government soldiers in a battle until he was injured by a missile strike and was taken to a hospital. The FBI said he admitted he was paid $100 monthly by al-Shabaab while he worked for them from August 2011 to December 2015. 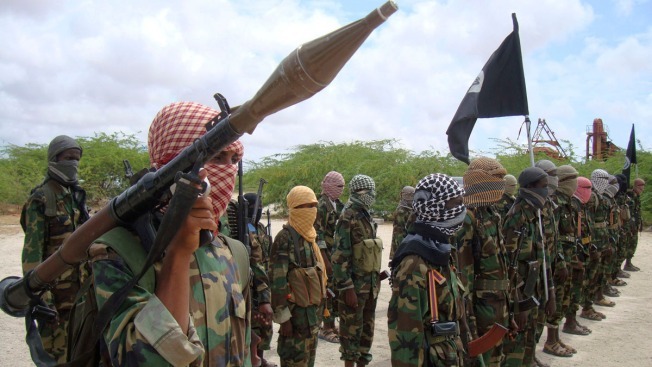 The FBI said al-Shabaab announced it had merged with al-Qaida in 2012. Assistant U.S. Attorney Andrew DeFilippis told U.S. District Judge Paul Gardephe that prosecutors soon would be turning over "extremely voluminous" evidence to Jones' defense lawyer. The evidence will include FBI summaries of Jones' statements and electronic media, including videos pulled from computers disk drives and telephone records. Court documents say Jones was recorded on at least two videos with other al-Shabaab fighters. A criminal complaint alleges that the government's witnesses include a former commander of the group's foreign fighters, including non-native Somalis. Defense attorney Irving Cohen said outside court he was looking forward to reviewing the evidence on his client's behalf. "It is what it is," he said. "We intend to go ahead and fight these charges." Jones remains held without bail.